Stab, Scheme, Dodge, and Survive your way to Votes and Victory. 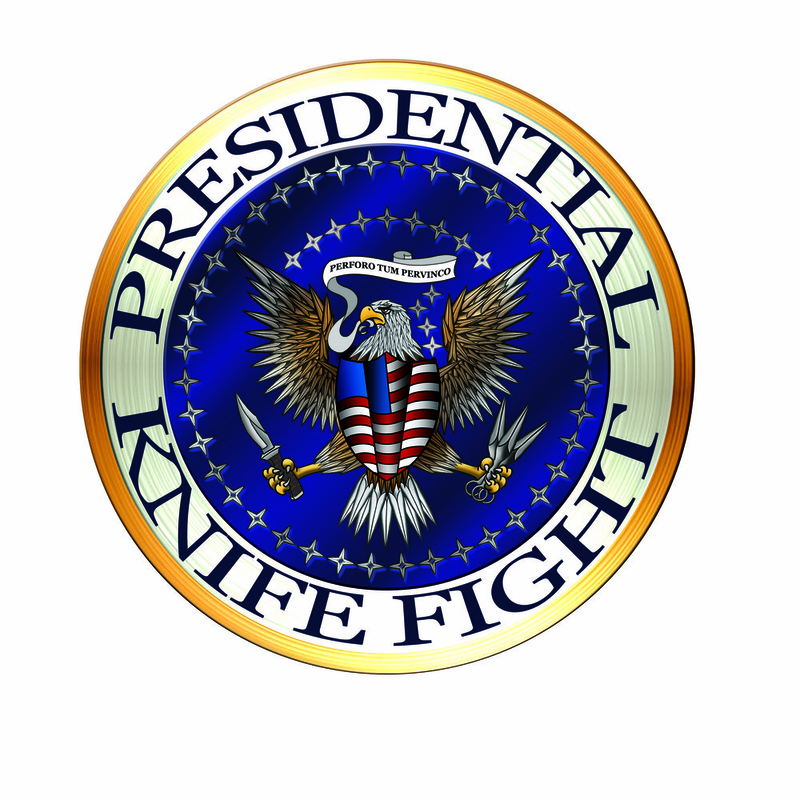 Presidential Knife Fight is a fast-paced, "Take That!" style card game where players battle it out amongst the former Presidents of the United States of America to determine who should be the Supreme President of these United States. Starting the Game: The game starts with each player receiving 3 presidents and 3 action cards. Everyone will choose which president they will play with first and keep the remaining presidents in their hand. Everyone will ANNOUNCE their candidacy by telling the table which president they chose and that PRESIDENT'S abilities. The player with the lowest numbered president goes first (i.e. george washington always goes first if he is at the table). Turn Order: Every turn you get three moves and you can choose to draw new cards, play action cards, and/or stab a president next to you. You may only choose to stab SOMEONE once, however, there are action cards that allow you to wound your opponents as well. Back from the grave: Once you are stabbed to death and your corpse is added to someone else's victory pile, you can choose a new president from your hand or the deck. You will ANNOUNCE your candidacy and return to the game at the start of your next turn. Corruption: Just like in real american politics, corruption abounds in this presidential melee. Certain action cards and abilities (like "bribery") can be used to get you out of a bind, but you are now corrupt and gain corruption counters. If you receive 5 corruption counters, you die and you lose a vote from your pile. Abilities: Each president's ability is based on their time in office. This ability helps you manipulate game play. As of now, the Pre-Order widget on this website is the only place to reserve your copy. Is Barack Obama in the game? Barack Obama has not joined the Presidential Knife Fight, but some day he may. Does the game only have American Presidents? Presidential Knife Fight features past Presidents of the United States, but may eventually include American Legends (such as Uncle Sam and Lady Liberty) and other famous world leaders (such as Winston Churchill or Napoleon). But what if I'm not American? You can still play this game and have a good time, but some of the jokes may go over your head. Kind-of sort-of, learning is 100% optional. 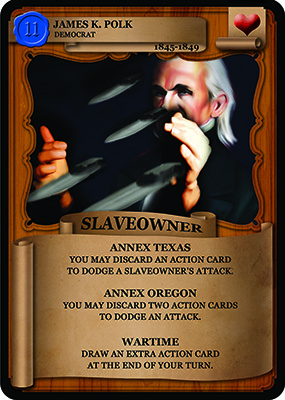 All the cards are inspired by history, but not being a history buff (or nerd) won't hurt your ability to play. Disclaimer: All characters and events in this game- even those based on real people- are entirely fictional. This game does not endorse violence, of any kind, towards anyone. Especially against the President of the United States, current or former. Please play responsibly.